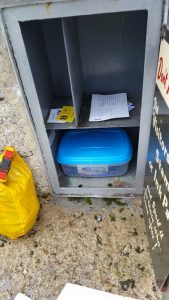 As well as seeing Dartmoor’s Deadliest and the Ted Hughes Memorial Stone our mammoth walk last month (incredible to think that July is already ‘last month’) included our first visit to the famous Cranmere Pool letter box. 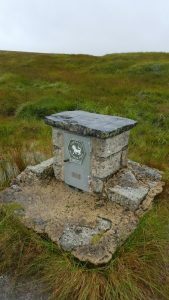 This site is a kind of Mecca of Dartmoor and it is a sort of pilgrimage to go there. I admit to having never got there before; I have been within a kilometre of it many times. Venturing that last leg over very wet and boggy ground has usually not been top of the list. However I am so glad that, despite Dartmoor throwing at us its hardest and wettest rain, we did make it to the remote spot that contained this little treasure. This spot has its own ghost story – as all good locations on Dartmoor do. 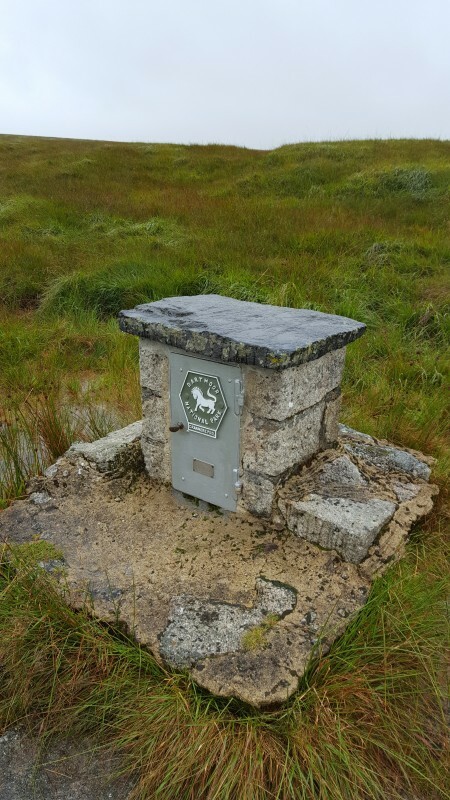 You can read about it at the fabulous Legendary Dartmoor site. 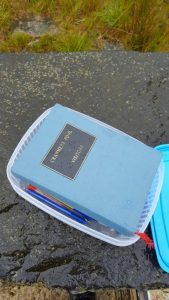 As you can see from the pictures, the letterbox was well equipped with visitors’ book, pens, ink stamp and pads. We duly stamped our books and after reading a lovely comment by ‘Josh’ who pledged to bring his wife someday, we wrote our own message in the book. We also left something else in keeping with the tradition of the box. 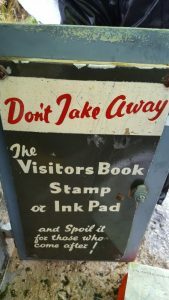 A tradition has been going for a while where you leave a postcard in the box for the next person to take home and post. There was not one there for us to post but we did leave one in the hope that the next visitor will be kind enough to post it. In true Blonde style though I forgot to put a stamp on it, so the next visitor will have to be extra kind! Be warned if you are considering finding Cranmere Pool; it is not called ‘pool’ for nothing! The ground surrounding it in all directions is very wet and boggy, even in the middle of summer. You will be walking over rough terrain with not many visible features to aid your navigation and no paths of any description. I would strongly recommend that you only attempt this if you are a competent navigator and know your stuff when it comes to moorland walking. I didn’t know about the ghost story, but I do remember wading through a pond, not to mention seemingly endless marshes! I don’t remember the letter box being so prominent, though. When I get a minute I shall hunt around and see if I have a photograph, though I may not have carried a camera. They were much bigger then! A photo would be great – there was a pool at Cranmere Pool once and probably will be again judging by the amount of water there!